Here is a picture of the Haitian-American Jozy Altidore at the 2014 World Cup in Brazil. He was forced out a Match between United States and Ghana very early due tho an injury where he pulled his hamstring. The expectations for him were high in this World Cup in Brazil. With this great player in the team, many people were expecting that the United States will make a better presentation this year. 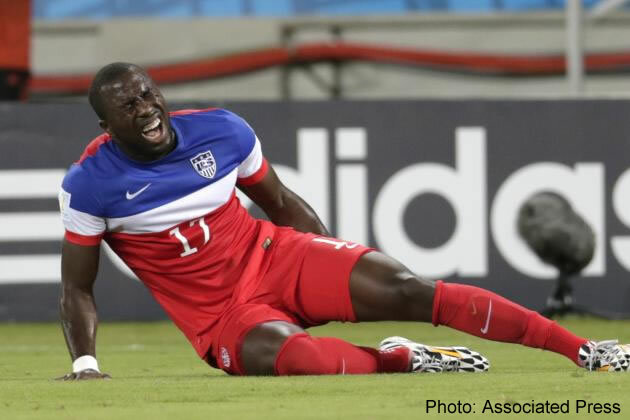 So what do you think with the injury of Jozy Altidore. Do you think it's still possible for the U.S. to make a good presentation in the 2014 World Cup?